When it comes to residential electrical work, it is best to enlist the help of qualified electricians. By doing so, you can be confident that your requirements will be addressed in the safest and most professional manner possible. 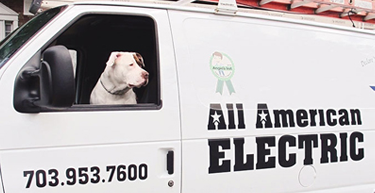 Choose All American Electric for dependable electrical solutions in Fairfax County, VA. Whether you need troubleshooting, installation, or replacement services, we have you covered. When you turn to us, you can declare your independence from high prices. We offer all of our services at competitive rates! Our electricians are among the most knowledgeable in the city. We have more than 100 years of combined industry experience. We are managed by a father-and-son team. Trust us to treat you like family and ensure that your electrical systems work properly. Forget about the hassle and danger of doing electrical work. Let us take care of the job for you. Call us to book an appointment with our staff. We proudly serve residential clients in the Fairfax County, VA area.